There’s a lot of talk about America’s new economy and how we all have to do whatever is necessary to adapt to it. These animals’ view of America’s new economy is an economy based upon the productive being enslaved by the worthless and, as every previous attempt of this Keynesian nightmare has shown us, this economic model is doomed to utter failure. As far as I can see, most of this talk – and all the jabbering spewing out of the maws of Obama and his coterie of vermin – should be rejected by we, the People of the United States of America – rejected by force and with extreme prejudice if needs be. Already America is in a state where and when for every 1.25 productive citizens there is one resident that is either being supported through welfare or who is employed for the government in some capacity. A 1.25:1 Maker to Eater & Taker ratio is ridiculous, abhorrent to men of good character, and utterly unsustainable. 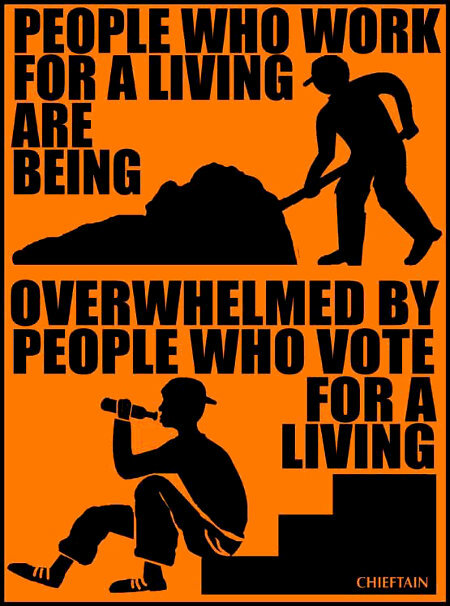 If America’s new economy is one where people who work for a living are being overwhelmed by people who vote for a living, then it’s time for drastic change starting in DC, working down to the ghettos and slums, and not stopping until America is cleansed, purified, and reborn once again as nation it was created as and always meant to be. This entry was posted on Tuesday, January 29th, 2013 at 8:14 am and is filed under Politics. You can leave a response, or trackback from your own site. The question is, how do we get to the folks who might be takers, but are on the edge? I don’t know, Pino. The only means be which to so that I can see is a combination of reeducation and scrapping most of the programs so that they really have no choice.